Home Chef focuses on offering quality meals and ingredients that are fully prepared and ready to cook. Their plans offer lunches and dinners and a few breakfast items are available as well. Our Home Chef Review details how you can order various meals and ingredients that fit in perfectly with your dietary needs. The instructions offered by Home Chef are also very detailed ensuring it is easier for you to receive meals prepared the way you want. The meal kits all come with recyclable packaging materials, thus keeping any waste produced by a shipment from being too a minimum. You can also choose from various meals throughout the year. Home Chef offers a rotating menu that includes many meals you are bound to enjoy trying out. Sign up to get meals from Home Chef. You can do this through the Home Chef website at homechef.com. You can choose particular dates to get your meals mailed out. You can also skip weeks if you are not at home such as being on vacation. Your meals are automatically delivered so be sure to notify them when you need to skip some weeks. Determine how many meals you want per week. You can ask for two, four or six meals in a week. Select the meals you want to eat in your plan. You get to choose eleven recipes for your plan. These include various meals that include steak, pork, fish and even some vegetarian options. Home Chef typically rotates its recipes on a monthly basis to keep things fresh in terms of what is being offered. Your box is then delivered on your specified date. The box is fully sealed and insulated. It also comes with ice packs to keep everything cool, although it is best to get everything into a cooler spot as soon as you receive your package just to be safe. The box includes all the ingredients chosen as well as recipe cards.The individual recipes are divided up into separate sections in your delivery box. This ensures that all the ingredients you need for your meals are easy to find and use. Simply prepare your dinners and enjoy. All you have to do is follow the instructions, its the simplicity of what Home Chef offers that makes it easy to follow. What Makes Home Chef Unique? Home Chef is popular as it concentrates on offering fine ingredients from quality suppliers. The company focuses on using locally sourced ingredients. These are also prepared with sustainable farming and raising processes to ensure that enough food is available. For Home Chef, it is about the quality of the ingredients and not the quantity. This ensures that the foods being offered are planned well and are easy for people to enjoy. The company’s recipe cards are also thorough and detailed. Unlike other places that might just list details on how to make something, Home Chef uses cards that list pictures of all the things you can get prepared. You will also get information on things like what to do as you prepare to start something up, things to watch for while you cook something and even points on what makes a particular entrée so special. The thorough and specific points included in each guide will give people the foods that they deserve. The great thing about these meals is that they can be prepared rather quickly. You only need about 30 minutes to get a typical meal from Home Chef prepared. This is great timing that gives you more of an opportunity to enjoy the foods you are making with your family. This all works without any commitments needed. You can skip or cancel a program at any time, but you might stick around for a while when you consider what makes the foods offered by Home Chef appealing and great to eat. The ingredients you will get in a recipe are divided up properly in their own sealed materials to ensure they don’t get in touch with each other. The vegetables or meats are secured well and sealed air-tight to keep air from getting in and prematurely spoiling your ingredients. The ingredients also include various spices or seasonings that are carefully measured. Some dairy items can also be included in chilled containers. These are always kept separate from the other ingredients which is convenient for people with certain food allergies. Dinners: You can find some attractive dinners of value. These include steak au poivre and chicken moutarde with roasted green beans. Smothered turkey meatloaf with mashed cauliflower is also available for you to try out. Lunches: Some of the lunches offered by Home Chef include soups and bowls. The Korean pork noodle bowl with green beans and the New England clam chowder with garlic and parsley croutons are among a few of lunches you can find. 5-Minute Lunches: The 5-Minute Lunches available here include some attractive choices that don’t require any cooking. You just have to keep the ingredients chilled and then get them mixed together. The Mojito lime chicken salad and the Asian steak salad are all good for people to find among other 5-Minute Lunches. 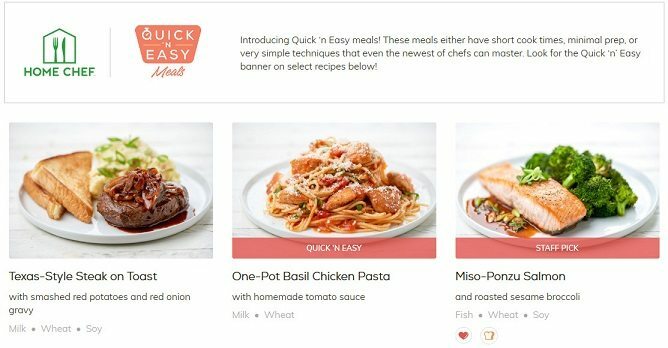 Quick ‘n’ Easy Dinners: Some of the dinners on the site are a little easier for you to prepare than others. These are the Quick ‘n’ Easy Dinners and they all come with great instructions that are easy for even the most novice chefs to prepare. These meals require little assembly and in some cases can take about 20 minutes or less for you to prepare. The basil chicken pasta, miso-ponzu salmon and turkey lettuce wrap are all good meals to check out. Smoothies: You can choose to get some smoothies added to your Home Chef program. These are easy to mix and come with many flavors like chocolate strawberry coconut with Greek yogurt. A blender is required to get one of these smoothies prepared. These smoothies often include milk and tree nut ingredients. Seasonal Fruit Baskets: You can choose to get a seasonal fruit basket added to your Home Chef shipment. This includes two servings of various fruit like Gala apples, navel oranges, Anjou red pears and much more. You can check out the details on the fruit basket through the Home Chef website to see what specific fruits are available during a particular time period. Vegetarian Entrees: Various vegetarian meals are available through the site. These include the corn and black bean burrito with Chihuahua cheese and teriyaki broccoli with noodles. You can review the recipes being offered at a certain time on the Home Chef website. The company always prepares its meal options in advance so you can choose what you want ahead of time or to skip a week if you aren’t finding enough stuff of interest to you. You would have to get these items chosen on the Friday before the appropriate week so you can actually get them sent out to you. Again, these will go to your property at a time that you have personally selected. The site always lists information on any allergens that might come about in a recipe. These include milk, soy and wheat ingredients. You can also find different foods that are made with low-calorie and low-carb diets in mind. Just look for the specific information on each recipe. When you look on the Home Chef website, you can click on any recipe that is available to see what it entails. You will get points on how a meal is prepared, its nutritional facts and a simple background of what you can get out of a recipe. The detailed listed are thorough and will help you get an idea of what you could order. Also, each item you order is based on one serving. You can choose to order the same food twice among your two, four or six meals in your plan to get two servings of that food. This is great if you want to share your meals with someone else in the household. Home Chef offers a section on its site where you can buy all of the materials that you might need to use for preparing your meals. You can get skillets, pots, mixing bowls, knives and cutting boards, colanders and strainers among many other quality ingredients. The meals offered by Home Chef cost $9.95 per serving for the most part. There are a few meals that cost a little extra for you to get. These are meals that come with premium ingredients. The lamb chops with fig red wine sauce and carrots is a good example as this costs $19.95 per serving. The 5-Minute Lunches cost $7.99. These lunches are cheaper for how they are a little easier to prepare. The apple and chicken salad is a good example of what people can find for cheap. It also costs $4.99 to get a serving of one of the Home Chef smoothies or a seasonal fruit basket sent to your home. For shipping and handling, it will cost $10 for shipping for orders of $40 or less. Delivery is free for orders that are worth more than $40. There are no sales taxes involved with an order. 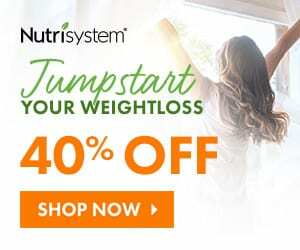 No Code Needed - Simply Sign Up! Earn 3 free $50 Home Chef trials for your friends and family after you complete 5 or more orders of $45 or more. Home Chef delivers to many spots around the United States. The company delivers the 48 mainland states and has distribution centers in Chicago, Atlanta and Los Angeles. Home Chef is great for you to check out if you are looking for a good food delivery service. Home Chef has a great setup for foods that provides you with fresh and whole ingredients. The variety of great foods is worth checking out while everything is easy to prepare and enjoy having in your home.